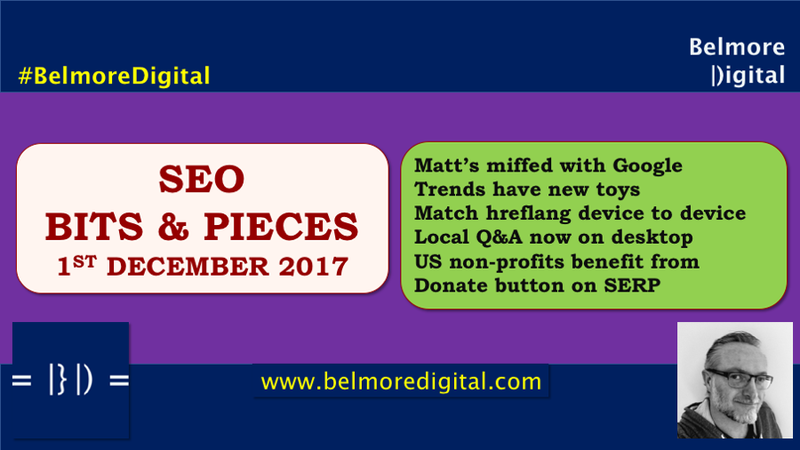 What are the latest SEO News & Updates for 1st December 2017? 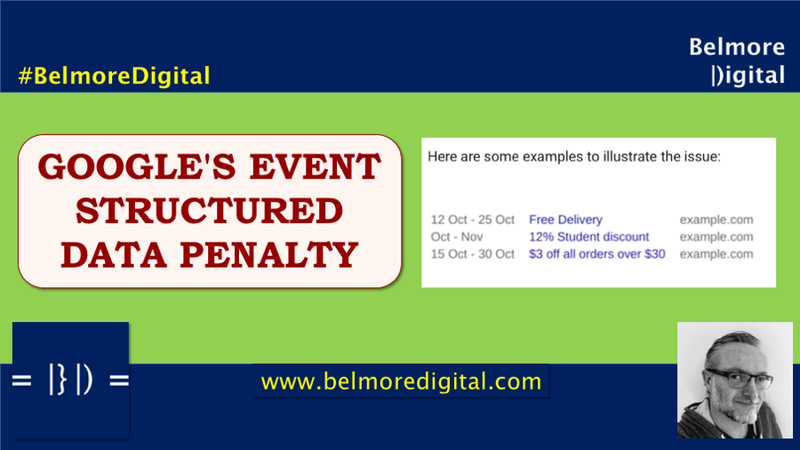 Google has posted on its webmaster blog about a new penalty for webmasters who abuse structured data markup for events. This is as a result of user complaints about webmasters listing sales and discounts as events. It’s a manual action, which will show up in Google Search Console, and means that *no* rich snippets for your domain will show up in SERP, until a fixed and a reconsideration request submitted. This does not directly affect rankings, but it will affect performance from search. Check your structured data markup complies with Google’s guidelines for event markup. Even if you’re sure it does, double-check to make sure. If you have been “over-enthusiastic” in your application of this markup, then you need to remedy it to remove the structured data markup for non-events. And you would be well-advised to do this pretty quickly. Of course, If you have been spamming deliberately, then you have the choice to wait until Google catches up, or fixing it. If you receive a manual action, then you will need to remove the offending markup and submit a reconsideration request. And then wait. Who says structured data markup isn’t important? I’ve seen a number of wise SEOs mutter that it doesn’t alter rankings (which it doesn’t) so therefore it isn’t important (it is). It’s important because it helps Google to understand your website’s content better, at least indirectly, and because it can give much more exposure on SERP – think of the big block of delicious text and data that can be yours for well-applied structured data. Now, because of this, people spam it. Essentially, it if can appear on search, people will spam it. That’s their decision, they can live with the consequences. Google’s algorithm is not yet sophisticated enough to detect this spam fully yet – or else it wouldn’t appear in search. So, what you should be doing is marking up your code properly, especially events, and be very careful around what counts as an event. It’s not a sale, or a discount period, despite what the marketing department might say. In a slightly different, but similar, vein, John Mueller also muttered that your structured data should match what is visible on site. 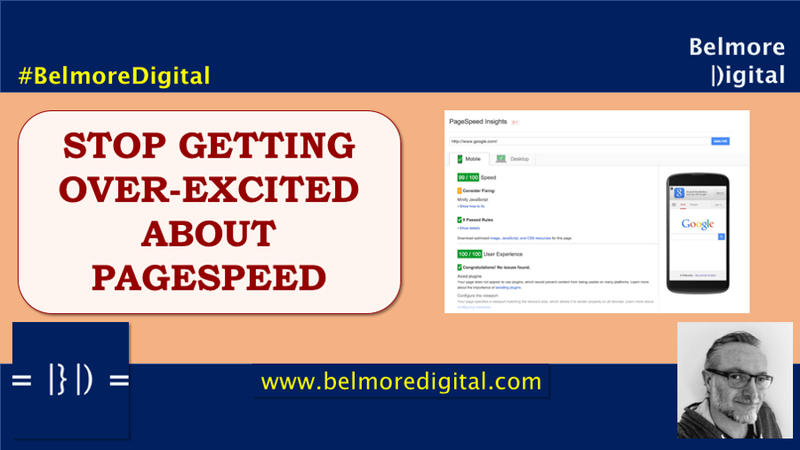 Webmasters are getting over-excited about PageSpeed. There have been a couple of examples where people have been wondering if Time To First Byte (TTFB) and others bits are critical for ranking. Time to First Byte is not used for ranking, and the critical moment for Google is when a user can interact with the page (which is very tricky for Google to determine). They need to remember that Google is (and always has been) a relevancy engine. PageSpeed is assessed post-relevancy. Use Google’s Page Speed Insights, but remember it is at an individual page level, not at a site level. Remember that speed, or lack thereof, can be transitory, as servers get busy, as do routes. Also, remember that speed can be illusory, meaning that you can give the impression of speed without actually always being quick (eg, get the first screen painted double-quick-smart, even if your page take a while to load as a whole). Make sure your server and hosting package are up to the job. They will make more difference than code-fiddling, unless you have really, really, bad code. Finally, remember that Google’s PageSpeed is a fresh load of everything each time. If you are using cached resources, then their speed report is absolute rather than relative. Click here to contact me to discuss how to speed up your website properly. Techie webmasters are generally foaming at the mouth over Page Speed, they can craft arcane code which shaves nanoseconds of the initial load of a cached resource. That kind of work is pointless, unless you are failing to cache things properly. Instead of trying to make websites load more quickly, the heavy-duty coders of this world should be focusing their efforts on streamlining any code which is used dynamically, and dumping any dynamic code which could be served statically. Fat chance of that however. In the meantime, however, we’ll have to put up with over-excited posts about how someone spent hours, days, weeks, to shave code which will never be repaid in revenue, and which would have been better spent producing something revenue-generating. To some extent, this is just webmaster chest-beating, but it can have real-world consequences as other webmasters spend hours chasing down minimal incremental gains when they should be working on creating more revenue-generating content. As a small additional side note, remember Google doesn’t even want to send traffic to websites. If it can show the data with no click, it will. Pete Meyers from Moz has produced an excellent analysis (even using Moz’s poor excuse for a dataset) of the rise of Knowledge Panels in place of the recently disappearing Featured Snippets. Essentially, for a lot of broad head terms, the Featured Snippet has been replaced by a Knowledge Panel. Often the Knowledge Panel is slightly lower quality than one might expect, although given the broad nature of a generic head term, it’s perhaps not surprising. If you are targeting Featured Snippet generation, think long and hard about head terms. Undoubtedly there will still be snippets for some of them, but you’d imagine their days are numbered. Focus on the remaining 10-12% of search which generates a snippet. Or contribute better information to the pages which are being pulled from for Knowledge Panel information. Click here to contact me to discuss how to generate Featured Snippets. Ahhhh, Featured Snippets, the latest distraction in the ever-lasting game of Google Cat & Mouse. As I’ve said before, a lot of Featured Snippets are uselessly poor. Head terms and generics are always a bit of a challenge for Google. It cannot really divine a sensible user intent, so it struggles to produce a meaningful set of results, and often produces a stab-in-the-dark mish-mash of information, location, or ecommerce results instead. Now, imagine if you will, if Google were to slide the information into a Knowledge Panel instead of into the mainstream SERPs. Oh lookie – more space for ecommerce results. How did that happen? It all seems to be about snippets these days. First Featured Snippets, then disappearing robots.txt snippets, and now lengthening somewhat. Google is now regularly showing snippets of up to 230 characters, and occasionally 300 characters and beyond. Cue: SEO webmasters all over the world who have believed that a meta description should be no longer than 160 characters suddenly discovering they could write much longer descriptions. If you have only ever written 160 characters meta descriptions, you could be in for a fair degree of rewrite work. It’s not clear if Google will always produce longer description snippets, or if it is an occasional thing. Remember that Google has always said that for most searches it generates a snippet itself, rather than rely on a pre-written meta description. Whichever snippet is produced, like title tags, make sure that what you want to surface and be shown is in the first 160 characters, rather than leaving it all for a ta-dah! surprise at the end. Click here to contact me to discuss meta description snippets in search. Here we go. Google is really pushing down the “no need to click” line now, by pushing more information into the search results. There’s not a lot you can do about this. But if you have always focused exclusively on 160 character meta descriptions, then you may need to consider getting your writing tools out again. Well, it’s always been there, but someone has spotted this lovely little tip for creating a direct link to write a review for your business on Google Maps. Search for your business / location. Click your business location and copy the PlaceID shown in the result. Add that to the writereview URL to create your very own “Please Write a Review” URL. Include the URL in emails, social, web, anywhere you want to generate a review from. Obviously, stay inside the Google review solicitation guidelines (no incentives). Click here to contact me to discuss how to generate reviews for your local business. Sometimes, these little hacks are gold dust, a webmaster thinks sideways and publishes it for the benefit of the wider community. And, sometimes they are little Easter Eggs left there by coders for discovery, and sometimes they are loopholes left open by mistake. In this instance you have to hope it’s an intelligent use of data, rather than an accidental loophole which will get closed. Either way, while it’s open, make use of it. Reviews are gold dust and the most important thing in Local SEO, so get going and get some reviews while you can. Matt Cutts has had a bit of grumble about how Google links to the 10 blue links from SERPs (not that there’s always 10 of them). Essentially, Google is stuffing too much into the outlink, when it could just speed up everybody’s life and link plainly. This is the second time recently Matt has had a bit of a grumble at Google. Hmmm – next he’ll be moaning about an unjust Manual Action. Google Trends, that much misunderstood data tool, has added data for YouTube, Shopping, News and other Google searches. Cue lots of poorly understood data charts and graphs which don’t show what the presenter thinks they do. If you’re going to have separate mobile and desktop sites and hope you don’t get into too much trouble with the mobile first index, then you need to match your hreflang URLs across devices – so mobile to mobile, and desktop to desktop. It’d be easier if you just had a single mobile-first website. H/T Aleyda Solis on Twitter. Hooray! Google Local Questions and Answers are now rolling out to Desktop (see Mobile-First, innit?). I have to confess I haven’t seen much action on these in the SERPs I’ve looked at. For a number of non-profits in the US, Google has started to add a “Donate” button to their Knowledge Panel in SERPs. This is no bad thing, and apparently is a real boon for the charities concerned. This is a good thing. Hopefully, it;s not just for Christmas. H/T Google – for once. Google gets miffed with Events Structured Data Spam. Manual actions coming to a website near you. PageSpeed tweaks are getting out of hand. Knowledge Panels becoming more prevalent. Millions of 160 character meta descriptions need to be rewritten. 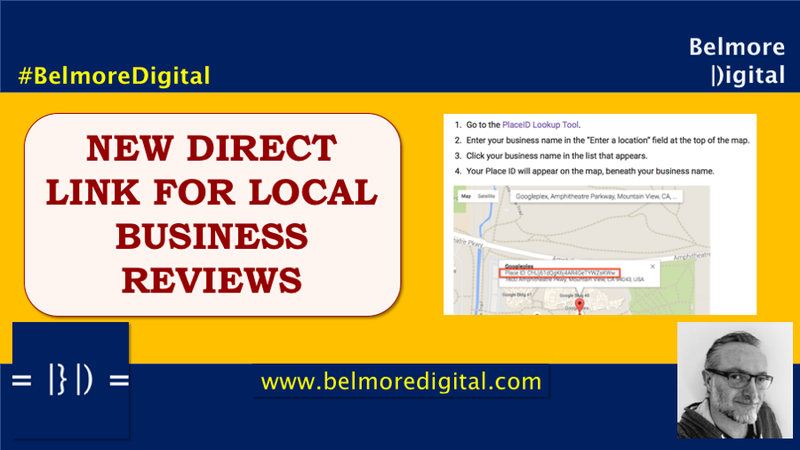 Get your direct review link for your local business to spam encourage reviews. 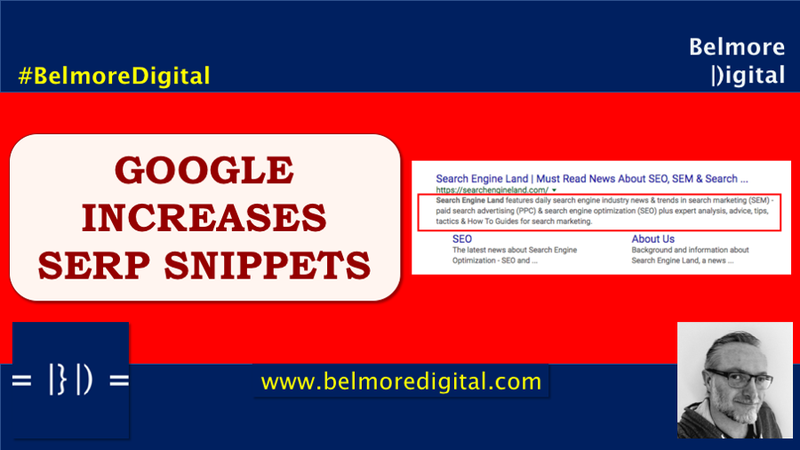 And lots of jolly information snippets in the SEO Bits & Pieces. 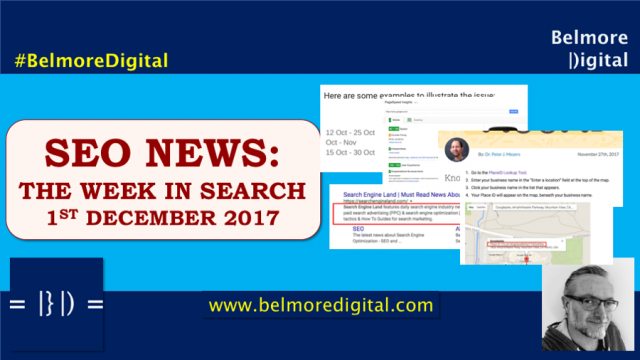 Thanks for reading the SEO News & Updates for 1st December 2017. If you would like to discuss what these changes mean for your web property, or would like to know how to implement them, please feel free to contact me.